I have been "trying" to perfect my skin care routine for a few months now by adding and subtracting products as I test them. I am still not 100% satisfied with the set of products that I am using. I was on the lookout for a face scrub and had tested a few but was still not content, so when Andalou Naturals sent their Chia + Omega Radiant Skin Polish for review I hoped this will fit in to my routine. Was this product up to my expectations? *ANDALOU naturals is an American natural cosmetics brand located in California. The brand’s philosophy is based on merging advanced research in Fruit Stem Cell Science with a minimum 70 % content of ingredients from certified organic origin. ANDALOU naturals’ products do not contain sulphates, petrochemicals, phthalates, synthetic Colours and dyes, artificial fragrances, triclosan, GMO, PEG, MEA, TEA, DEA, synthetic preservatives or parabens. This skin polish is packed with a lot of promise with Fruit Stem Cell Complex and omega-rich emollients. Initially, when I read "Skin Polish" I was slightly concerned that it might lighten my hair but that didn't happen because it is not like the skin polish we get at beauty salons. Its an exfoliating scrub made from fine granules of Chia seeds mixed with walnut powder which are "active" ingredients. The overall formula claims that this skin polish will "Stimulate healthy cell turnover for improved hydration and smooth texture with fewer lines and wrinkles, skin appears younger and fresher with a radiant glow". 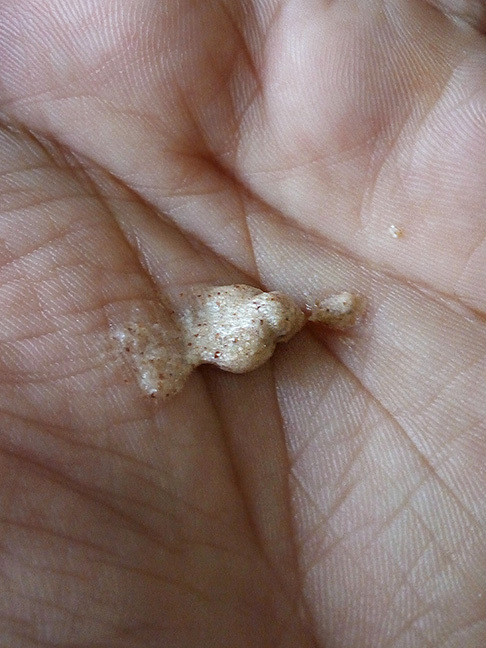 The scrub is suitable for normal to combination skin. My skin looks and feels really clean as well as smooth after using it and a little dry so a moisturizer is a must. This also means that if you have dry skin you need tons of moisturizer after using it. Now we do need to keep in mind that this product is still not suitable for every skin. It can be harsh on extremely sensitive skin as it can create micro-tears in the surface of the skin. That can be avoided by first doing a skin patch test and also by making sure you don't scrub like a mad dog. When using this scrub you should use light circular motion, the gentler the better. My skin felt instantly smooth and clear after using this the first time. I have been using it for a month now and have seen improvement. I do feel that it is a strong formula so I only use this twice a week. It is full of antioxidant so I usually leave it on for a few minutes before rinsing it off for better results. It smells refreshingly fruity and pleasant. Doesn't give any burning sensation and easily washes off. I do feel it makes my skin glow but I am not sure about the brightening part. Maybe that will take longer than a month to be obvious. 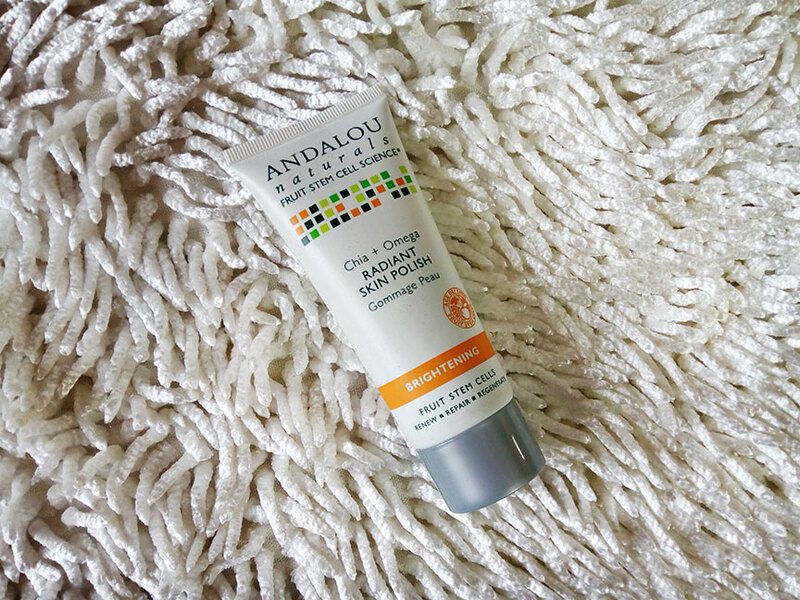 ANDALOU NATURALS Chia + Omega Radiant Skin Polish has definitely become a part of my skin care routine. It is a good product, just requires to be used as per my suggestion for better results. It definitely retails at a whooping PKR.1.355/- but is is a great skincare brand that can be trusted and I usually don't compromise when it comes to my face. You can buy this online from Just4girls.pk and can further avail 5% discount bu using my code J4GRA5 during checkout. See more updates on Andalou Natural's FACEBOOK Page.